"One cannot have too large a party." 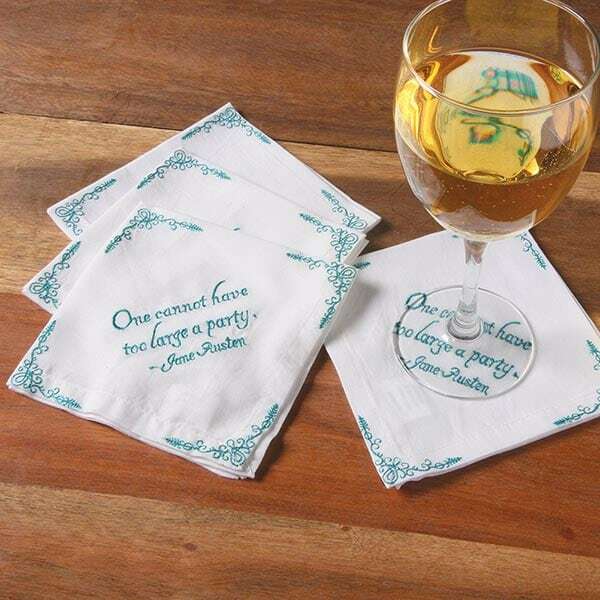 Add literary festiveness to a casual book-club meeting or a swanky soiree via our lovely cloth Jane Austen Cocktail Napkins! Embroidered in teal thread with the above proclamation from Emma and a prettily flourished border, each 100%-cotton napkin measures about 10"x10" (with a half-inch hem) unfolded, and folds in quarters to about 5"x5". The elegant entertaining accoutrements come in sets of four; stock up and start party planning!